Doors Plus is proud to be a Master Authorized Clopay® garage door dealer servicing Upstate New York, including Jefferson Lewis and St. Lawrence Counties. Choose either wood or steel carriage style garage doors from Our Reserve® or Coachman® Collections, while Our Gallery® Collection offers the carriage style garage door look at a more affordable price. If you're interested in a more contemporary look, choose from the Avante™ Collection, which combines contemporary aluminum and glass in sleek, modern designs. Our popular Classic™ Line of steel raised and flush panel garage doors will complement most home styles. Add one of the many decorative window options to create your own custom look. When we say beautiful, durable and reliable, we mean it. That’s why we offer the Clopay Gold Bar Warranty. 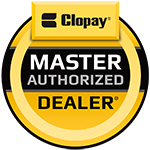 Available only through select Clopay Master and Authorized Dealers, the Gold Bar Warranty offers you the opportunity to upgrade to a Limited Lifetime Warranty on nearly all of the components of Clopay’s Premium Series, Coachman® Collection and 3-Layer Gallery® Collection garage doors.